The Branch is keen to recognise good architecture and design. Louis Hurley was a conservation architect based in Crickhowell. His skill and enthusiasm for the restoration of many historic buildings across south Powys and Monmouthshire was vital for preserving the built heritage of that area. He died a few years ago and generously left the Brecon & Radnor CPRW branch a small legacy which has enabled us to fund the Award. The Award itself consists of a revised version of the slate plaque used by branches for the Rural Wales Award. We invite nominations from our two local planning authorities in addition to our own suggestions, and site visits are then carried out. We would especially welcome nominations from the general public. 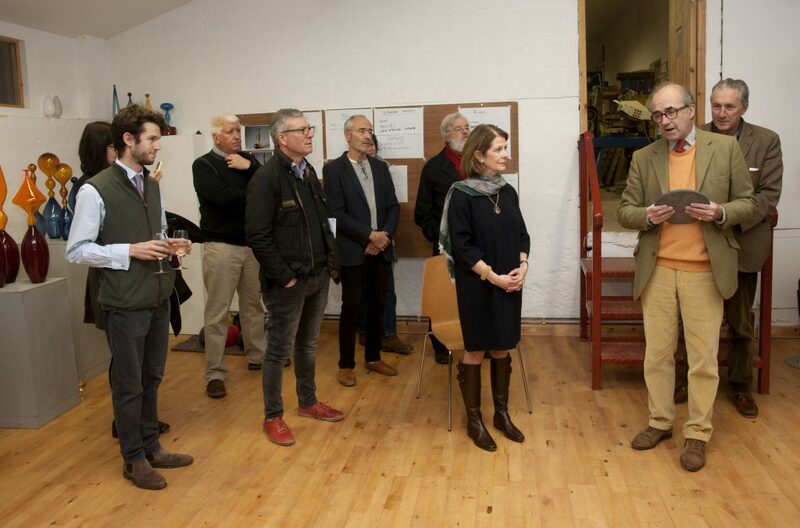 On Saturday November 24th (2018) more than 30 Brecon and Radnor CPRW members and friends enjoyed an informal evening at the Glass Studio, Hares Green, outside Presteigne, when Branch Chairman, Jonathan Colchester presented the Louis Hurley Award for architecture together with the 2018 Rural Wales Award. On this occasion awards were made for both 2017 and 2018. 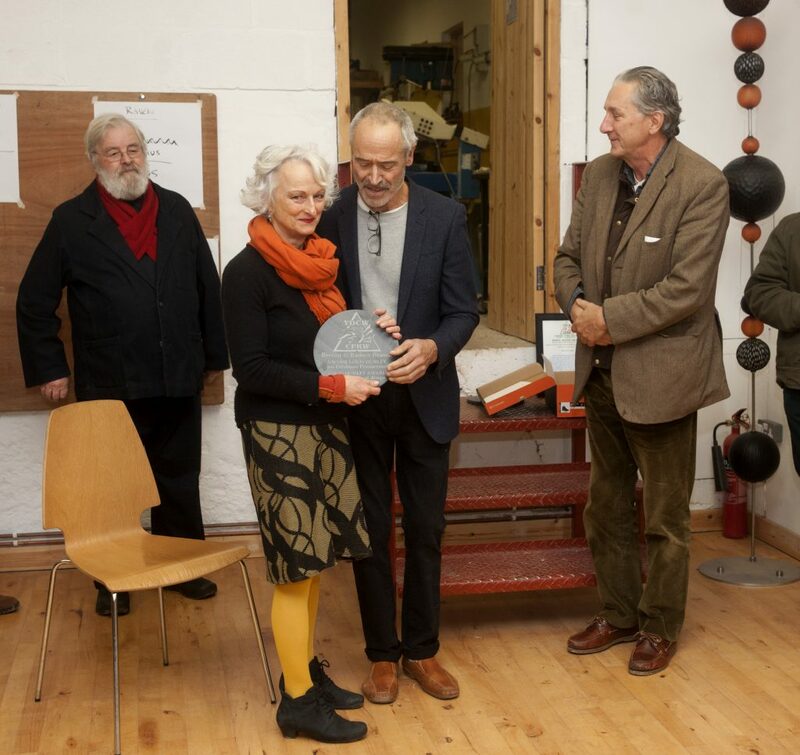 The Louis Hurley award for 2017 was presented to the international glass artists, Monica Guggisberg and Philip Baldwin, for their imaginative and highly successful conversion of an old Dutch barn into an exciting and beautiful Studio and Gallery. The design and project director was David Bamford of The Workhouse, Presteigne. Monica and Philip latest stunning art work, is a commission to create a major glass installation titled ‘Under an Equal Sky’, in Canterbury Cathedral which is on view until the beginning of 2019. The Louis Hurley Award for 2018 was presented to Mr. and Mrs. John Trew for the outstanding renovation work carried out on Upper Dolley House, near Presteigne, a wonderful example of a Grade II* listed Welsh Marches farmstead, with a long and rich history. A Highly Commended Certificate was also awarded for Radnorshire Wildlife Trust’s cleverly designed Caban building, to welcome visitors to their Nature Reserve at Gilfach, outside Rhayader. Darylle Hardy was very happy to receive the award on their behalf, having played a pivotal role in seeing the project to completion. The final Award of the evening was the Rural Wales Award 2018 which was awarded posthumously to Alan Loveridge for his outstanding dedication to scientific research and the gathering of data concerning environmental problems in Wales, and particularly in Radnorshire. 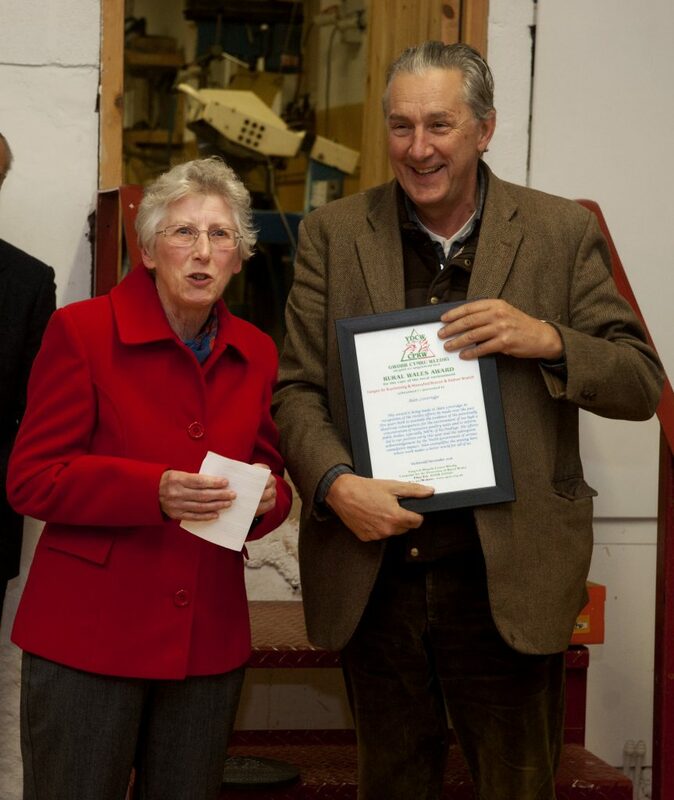 After acknowledging all that Alan had contributed in his work for the protection of the Welsh environment and landscape, Jonathan presented the Award to Janice, Alan’s widow. For all those who knew Alan, this was a poignant moment, but the Award was very much appreciated by Janice and her family, saying that although he was a quiet man, he would have been very proud to be recognised in this way. 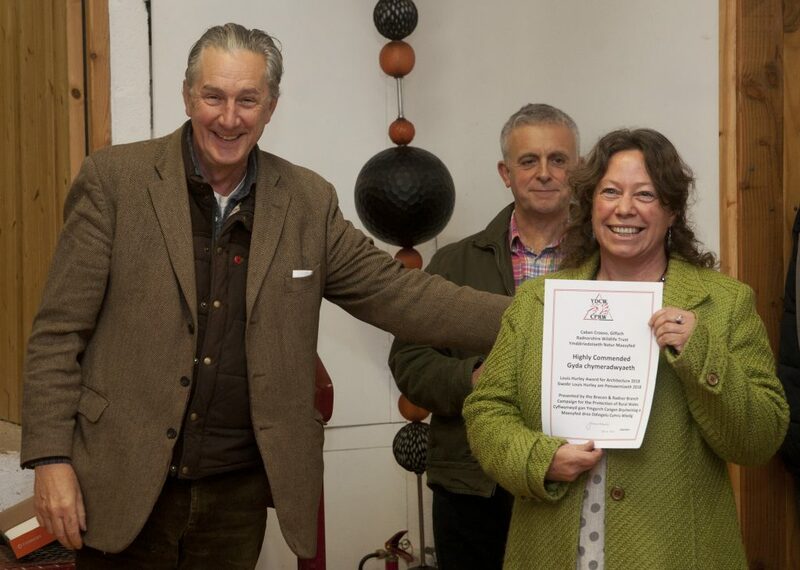 The evening concluded with drinks and a light buffet and the Chairman expressed the warm thanks of the branch members to Monica and Philip, for hosting such an enjoyable and inspiring occasion in their award winning studio. Wye Valley Canoes, Glasbury, for their impressive conversion of the interior of the former Baptist Chapel into a very superior reception and bunkhouse. In the same year we also awarded a “highly commended” certificate to the Pen yr Heol Chapel Stable. Richard Booth’s Bookshop in Hay-on-Wye in Brecknock – the main bookshop, whilst still trading, was badly in need of repair, refurbishment and updating when acquired by the current owner in 2007. The central courtyard area together with the Brook Street warehouse building were similarly in a state of some dilapidation, all requiring a very comprehensive programme of building repairs. The buildings are listed grade II. Discoed Church, adapted for multi-use as a concert venue, art gallery as well as a place of worship, and an adjoining magnificent restoration of a mediaeval house. The Brecon & Radnor Branch of CPRW values this Award as well for its positive comment on contemporary building development whether it is a restoration or a new modern develoment. We wish to recognise projects which demonstrate outstanding environmental good practice or promote improved awareness and understanding of our Welsh heritage. Since 1983 these Awards have showcased those individuals and communities who have made a difference. Members and the public are invited to put forward suggestions for the award. Chris Bruce for his technical skills in the use of GIS mapping software to show the distribution and impact of development, including wind energy, solar energy and intensive poultry units, in Powys. He investigated how proposals for wind and solar energy overlap highly sensitive areas such as sites protected for natural species, areas of peat stores, open access and common land and developed models to show how developments would visually transform our Powys landscape. He also developed an interactive website map of intensive poultry units in Powys which is helping to bring home the risks these pose to our waterways and biodiversity by increasing nitrogen and phosphate levels in vulnerable habitats. The Brecon Beacons Park Society in recognition of the enormous achievement in gaining International Dark Sky Reserve status for the Brecon Beacons National Park. Such is the quality of Wales’s night skies that Snowdonia National Park has now followed suit and has become Wales’ second and only the 10th destination in the world to be granted the status of an International Dark Sky Reserve, while the Elan Valley Estates have been awarded International Dark Sky Park status. We would especially welcome nominations from the general public for either of these awards. Nominations may be emailed to our Chairman, Jonathan Colchester.